COLUMBUS, OHIO (July 31, 2018) – What do fresh air, jamborees, and cutting edge health IT products have in common? Scriptel Corporation. 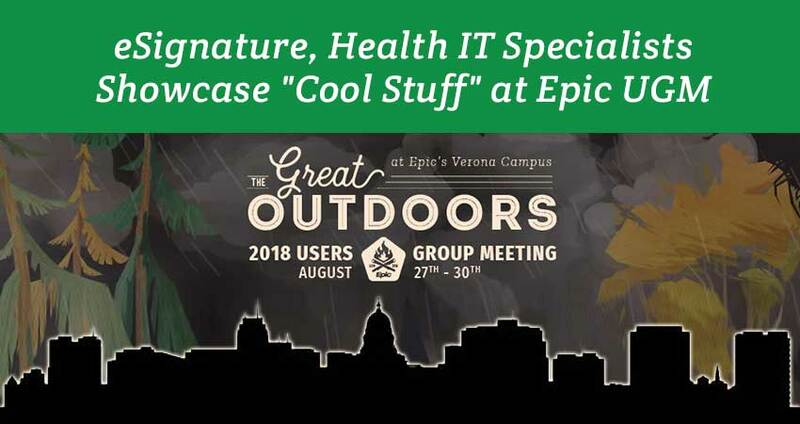 "The Epic User Group Meeting gives healthcare professionals a chance to explore and adopt leading document management and health information security technologies," says Scriptel President and CEO Stephan Herron, "It does that in a fun, relaxed atmosphere that promotes peer support and best practices. We're excited to be there." Attendees will be able to survey the changing healthcare landscape while gaining knowledge, guidance, and feedback from a community of like-minded individuals. This then helps them generate new ideas and glean insights into how cutting-edge products and applications can help them lead the way within their organizations. "Long-term strategic planning is a must, when your goal is to develop and launch targeted health technology initiatives," explains Herron. "By hosting a variety of formal training sessions, informal 'unsessions,' and 'cool stuff' breakouts, Epic is making the discovery process infinitely more enjoyable for all of us. "That's sure to provide end users of products like ours—ScripTouch Desktop or Compact LCD electronic signature pads, ScripTouch Sign and Save capacitive touchscreen software packages, the ScripTouch mSign app, and more—with the confidence and support they need to arrive at efficient, effective solutions of their own. "As they do that, they can rely on ongoing help from community partners like Scriptel." Findings by the American Information Management Association, in fact, demonstrate a need for long-range support. In "What the Data Say about HIM Professional Trends," the AHIMA urges tech gurus "to continue to evolve given the changing technical landscape (as it requires) HIM professionals to take on new roles and responsibilities." "It is important for HIM professionals to not only meet current requirements," stated AHIMA CEO Lynne Thomas Gordon, MBA, RHIA, CAE, FACHE, FAHIMA, "but also stay apprised of the future needs of the field." AHIMA also found that healthcare organizations are often in search of tech specialists with advanced experience in a number of associated fields. So, when it comes to healthcare IT, a diverse skill set and strong product knowledge both come in handy. "That's where Scriptel comes in," said Herron, "helping narrow the knowledge gap." Those interested in joining Scriptel at the Epic event can register, view a handy at-a-glance schedule, explore a list of topics being covered, learn more about the "cool stuff" on display, and find travel tips at UGM.Epic.com. Amazing graphics and animation make the website a pleasure to navigate, setting the tone for this unique experience. Scriptel staff will be on-site Tues., Aug. 28, and Wed., Aug. 29, offering consultations. Scriptel dominates the signature pad and digital workflow markets—with more than 3 Million Citrix Ready handwriting recognition and electronic signature solutions deployed worldwide in healthcare, retail Point of Sale, and other dynamic environments. Its reputation for outpacing the competition is backed by Industry Best service, unrivaled technical support, and user-friendly pricing. In addition, its full range of USB-interface and custom OEM components deliver rugged reliability. This makes easy work of ensuring the highest levels of information security and achieving zero-failure rates. Learn more at Scriptel.com.